Vonnegut had been writing about his war experiences at Dresden ever since he returned from the war, but had never been able to write anything acceptable to himself or his publishers—Chapter 1 of Slaughterhouse-Five tells of his difficulties. Released in 1969, the novel rocketed Vonnegut to fame. It tells of the life of Billy Pilgrim, who like Vonnegut was born in 1922 and survives the bombing of Dresden. The story is told in a non-linear fashion, with many of the story's climaxes—Billy's death in 1976, his kidnapping by aliens from the planet Tralfamadore nine years earlier, and the execution of Billy's friend Edgar Derby in the ashes of Dresden for stealing a teapot—disclosed in the story's first pages. In 1970, he was also a correspondent in Biafra during the Nigerian Civil War.Slaughterhouse-Five received generally positive reviews, with Michael Crichton writing in The New Republic, "he writes about the most excruciatingly painful things. His novels have attacked our deepest fears of automation and the bomb, our deepest political guilts, our fiercest hatreds and loves. No one else writes books on these subjects; they are inaccessible to normal novelists." The book went immediately to the top of The New York Times Best Seller list. 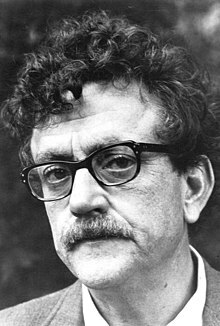 Vonnegut's earlier works had appealed strongly to many college students, and the antiwar message of Slaughterhouse-Five resonated with a generation marked by the Vietnam War. He later stated that the loss of confidence in government that Vietnam caused finally allowed for an honest conversation regarding events like Dresden. Hattenhauer, Darryl (1998). "The Politics of Kurt Vonnegut's 'Harrison Bergeron'". Studies in Short Fiction. 35 (4): 387–392. ISSN 0039-3789. (Subscription required (help)). Sumner, Gregory (2014). 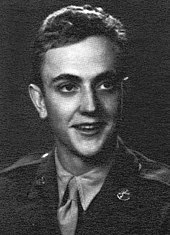 "Vonnegut, Kurt Jr". American National Biography Online. Retrieved August 14, 2015. (Subscription required (help)).